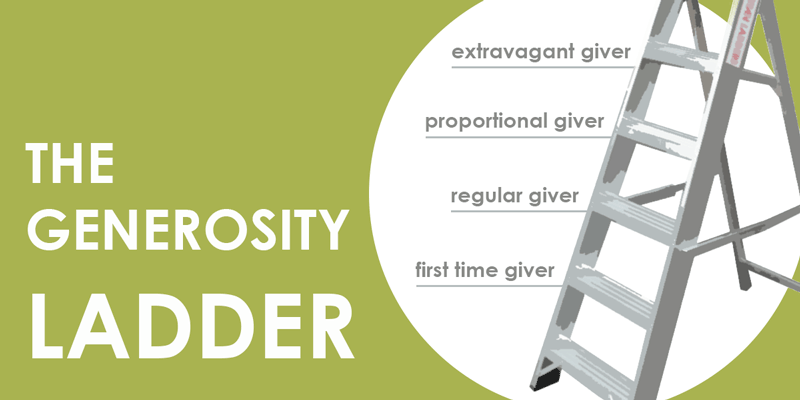 The Generosity Ladder is a tool designed to help a person move from money being their god to money being a tool for God's kingdom. The Generosity Ladder focuses on behaviors and attitudes of our hearts rather than on amounts or percentages, further transforming us into the likeness of Christ. We want to challenge every Christ follower to identify which rung on the Generosity Ladder they most closely identify with, and then by faith, take the next step on their personal journey. As you begin your personal exploration with the Generosity Ladder it’s most important that you first spend time in prayer asking the Lord where he is leading you to grow in your generosity and dependence on him. A First Time Giver is someone who is giving for the first time to the mission of God through the local church. Proactively schedule when you are going to give on your calendar. Set-up a recurring gift through the online giving pages or your own banks bill pay. A Regular Giver is someone who thinks of their giving in the same way they would other expenses in their budget. Giving regularly to the local church. Choose a percentage that would represent a new level of giving for you, potentially a Biblical tithe (Malachi 3:10). Look at the dollars you are not giving and prayerfully consider if God is asking you to give more. A Proportional Giver is someone who is no longer thinking "what am I supposed to give?" but rather "what am I not giving and why?". This person has made a commitment to tithe a certain percentage of what God has blessed them with back to Him - perhaps a Biblical 10% tithe (Malachi 3:10). They recognize that God is the owner, they are the manager. Prayerfully consider giving above and beyond your tithe to other projects such as the Missions Fund, Compassion Fund, or Mortgage Retirement Fund. An Extravagant Giver is someone that’s thinking past this year and moving toward long-term impact for their local church, their family, and eternity. They make decisions in the short term that have long term effects on their giving capacity. They consider the impact that every personal asset has on their ability to be generous. Set a lifetime generosity goal for your family. Put a cap on spending and saving so that every additional dollar can go towards kingdom giving.